Rocket plays hard and rests hard, with all his play, running, and resting dutifully recorded by the Whistle activity monitor. Upon attaching Whistle, an activity monitor for dogs, to Rocket’s collar the first time, I was super excited about being able to monitor his activity level. After visiting his vet three weeks ago, I realized just how important added exercise would be for Rocket. A couple days after I started using Whistle, my partner and I took Rocket to the vet. He was seemingly in pain, and was having some sporadic difficulty with his back legs during our walks. Our vet told us our Corgi–Pit Bull mix was exhibiting signs of a painful, possibly degenerative back issue, commonly associated with the Corgi dog breed. We were also warned at 49.6 pounds, he was too pudgy, and needed to lose weight. We were instructed to cut down on his food intake by 20 percent. I must admit I felt like an embarrassed child being scolded by her finger-wagging parent. I initially changed Rocket’s activity goal from the default of 30 minutes to 45 minutes per day. After a few days, I realized 60 minutes was more appropriate, as no added effort was needed to reach a 45-minute goal. We needed to step it up. For three weeks, we have been walking more, playing more, and paying closer attention to Rocket’s diet. While Rocket is still having some issues with his legs during walks, the problem isn’t arising quite as often. He seems generally happier; there is more pep in his step. Most nights, instead of standing in front of us, staring intently, loudly begging for a bully stick, he curls up on the sofa and falls fast asleep. I took him back to the vet earlier this week for a follow-up visit. The vet said she was happy to see in only three weeks, he had, in fact, dropped one pound. Granted, he has a lot more to go, but I was told many people seem to have a hard time actually reducing their dog’s food. This is a great start. In addition, I scrolled through Rocket’s daily and weekly activity reports with the vet. She said 60 minutes is, indeed, an appropriate activity goal for Rocket. She was glad to see on many days, he greatly surpassed his goal. I asked her if she noticed any irregular activity, or if she would advise me to change up his routine. I was told it was great to find Rocket was getting at least 20 minutes of activity several times a day. Apparently, many people, due to their schedules, feel they are only able to take their dogs out for about 10 minutes or less, a few times a day, to do their business. The vet said it is ideal for a dog to walk or play for at minimum of 20 minutes, to reach his ideal target heart rate. The vet had never heard of or seen a Whistle device before. She seemed pleasantly surprised this technology is available for dogs. I asked her if she considered the information provided to her by the Whistle readouts to be useful. She said it is, indeed, useful. She added it is even more important for dog owners to understand how much activity their dog is receiving, and to take ownership of their dog’s health. 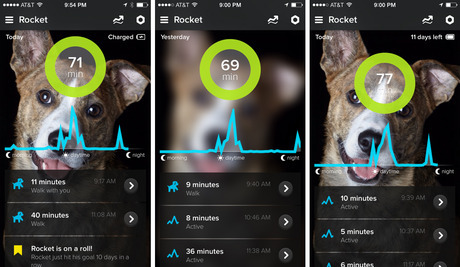 With Whistle, I am doing exactly that…taking full ownership of Rocket’s health. And I feel empowered (see sidebar, “Whistle Overview: Week 3”).